THE VARSITY BASKETBALL TEAM practices plays in Leavy Gymnasium as they prepare for season competition. The Rose City Roundball Classic will continue tonight at 8:00 p.m. for the Cubs. 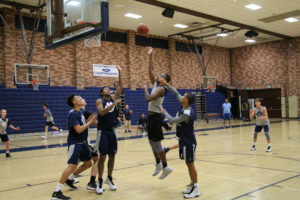 THE VARSITY BASKETBALL TEAM practices plays in Leavey Gymnasium as they prepare for season competition. The Rose City Roundball Classic will continue tonight at 8:00 p.m. for the Cubs. The varsity basketball team, led by head coach Jamal Adams ‘90, began its season with a win against West Ranch High School on Tuesday, Nov. 29, after finishing last year’s season with a 14-16 season record, including a 4-8 Mission League record. The Cubs first win this season comes in the first round of the 14th annual Rose City Roundball Classic, in which they defeated West Ranch High School 70-66. The team will continue tournament play tonight at Maranatha High School. The Cubs’ Mission League debut will be against Harvard-Westlake on Wednesday, Jan. 4. Adams said his objective for the season is to win a Mission League Title. Adams has sustained a 227-77 record as head coach in his 11 years at Loyola. Following the graduation of five seniors, this year’s team has nine seniors. The team also features five juniors and three sophomores. After the Rose City Roundball Classic, the Cubs are scheduled to compete at the Beverly Hills Tournament on Monday, Dec. 5.